Documentary photographer John Miller (Ngaitewake-ki-uta, Uritaniwha, Ngati Rehia hapu of Ngapuhi) was born on Auckland’s North Shore in 1950. He was brought up in various Northland towns, where his mother taught in primary schools. After a year of high school in Whakatane, he ended up in Wellington, where he was taken under the wing of Dame Joan Metge, who ensured he finished his secondary education. The first photos that Miller took were in May 1961 while holidaying in Auckland with his father. He did little further photography until he started attending Victoria University in 1969 and started photographing demonstrations, with the pictures being published in Salient, the student newspaper. During this time the country was experiencing a degree of political and social upheaval and Miller’s interests became more directed toward documentary photography. He photographed the anti-Vietnam War and anti-South African sports tour movements of the late ’60s and early ’70s. 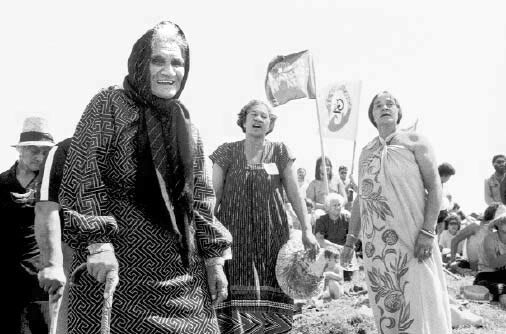 In 1971 he started photographing the new wave of Maori protest spearheaded by Nga Tamatoa. 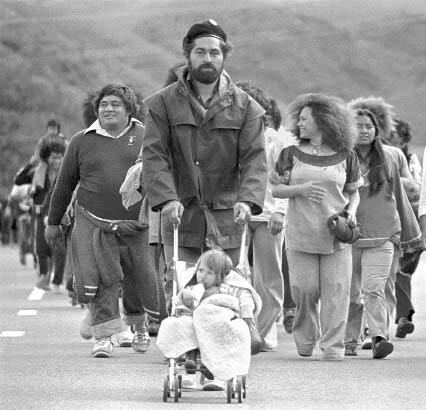 He was also present at the arrival of the Maori Land March in Wellington on 13 October 1975. Miller has said “I seem to have been performing the role of a sympathetic observer, insofar as I tend to support the causes that motivate such protests, rallies or meetings” and acknowledged that his family connections have given an added dimension to his approach to covering the ongoing pursuit of tangata whenua for Tino Rangatiratanga. While he didn’t start out with any “grand design to compile the definitive archive”, the material he has gathered over a thirty year period has resulted in a large and valuable photographic archive. His work has appeared in countless books, and numerous exhibitions including ‘Restless’ at MIC Toi Rerehiko in 2007, and ‘Photo Histories’ at Govett-Brewster in 2009. A long-time advocate for the importance of the place of the independent documentary photographer, Miller received a Media Peace Award for Lifetime Achievement for Documentary Photography, in 2003, and shared the 2009 Arts Foundation Marti Friedlander Photographic Award with fellow documentary photographer Mark Adams.